The wind was forecast to start blowing but not until about lunchtime. There was also rain forecast, but unlike the summer downpours, the steady drizzle does not really put the fish off. In fact, I think it can work in you favour, by breaking up the surface of the water and disguising your approach. You will all be relieved to find out that the tax return is finally done – much more painful than having a tooth pulled and far more expensive! So I wrapped up warm and set out early. 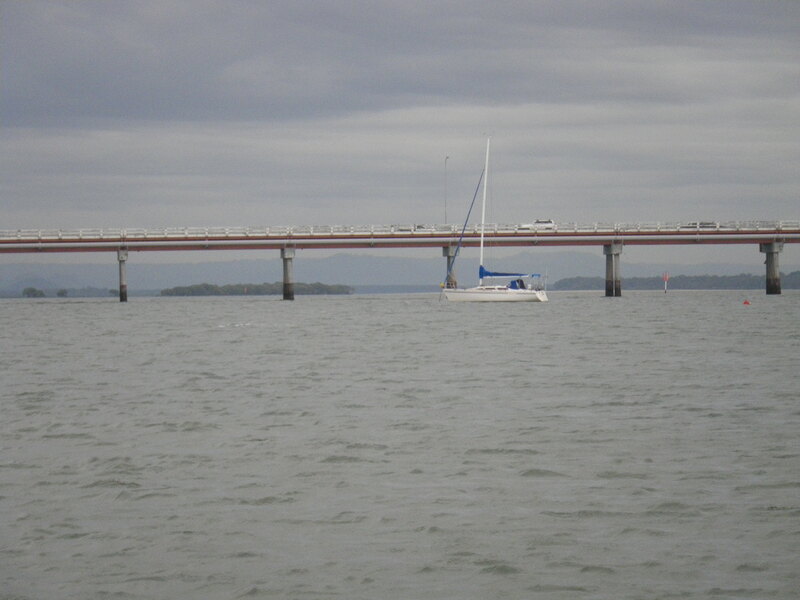 I arrived at Bribie at about 5.30 am and decided to start fishing on the island side, under the bridge lights. There are some good weed covered sandbanks forming just north of the bridge and also a couple of holes, just to the south. This area gets fished a lot and it is also a favourite spot to cast a net for some live-bait. You therefore need to get here early to stand a chance of finding it undisturbed. The fish renew with each tide so a run out tide around dawn is a good time to fish here. Low tide would be at 8.00 am so this morning looked good. I started fishing with the GULP 4” Minnow soft plastic in the Smelt colour on a 1/8th 1/0 jighead with 12lb fluorocarbon leader, tied on to 8lb braid. Unusually there was not much surface action. There was plenty of bait in the water but the Pike did not seem to be present. I cast around to the north of the bridge for about 20 minutes with no luck, so moved to the south side. Just on first light I felt a good hit as I pulled the soft plastic cover a weed bed. I dropped the rod tip, paused and counted to 10. I count to 10 pretty fast on the first fish of the day. I lifted the rod tip and set the hook. 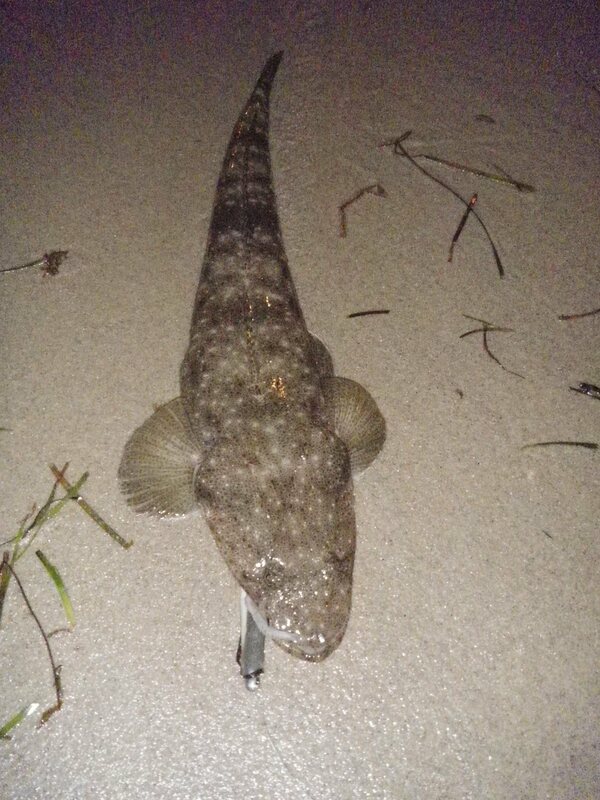 After a brief fight, I had the first fish of the day up on the sand – a nice Flathead about 50cm long. I released it – the family are in revolt, demanding red meat for a few days. I cast back in the same spot. 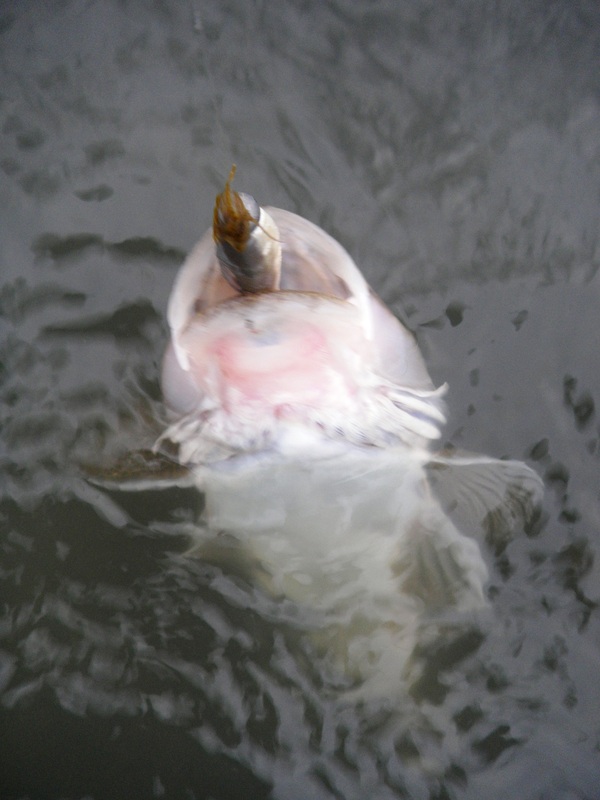 My lure was hit again, as it sank but this time I was too quick and failed to pause, I struck to soon and did not hook the fish – just pulled the soft plastic out of its mouth. I tried but I could not persuade that fish to try again, so I moved to the north of the bridge. It was getting lighter now and raining, but not heavily. I waded along the edge of the weed bank, casting back, up into the tide, which was still running out. 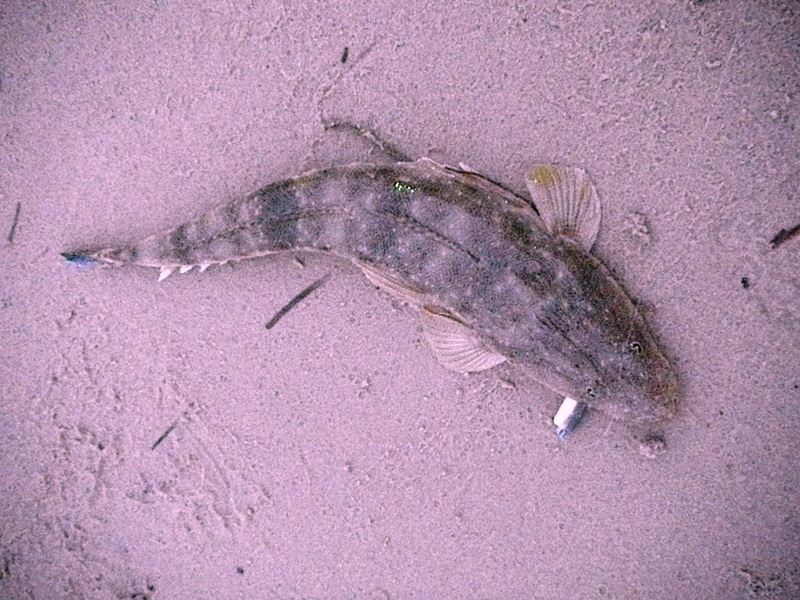 I soon found another Flathead – this one was about 35cm – I let it go and moved on. I paused in front of the rocky patch, beside the boat hire place and concentrated on this area for a while. This paid off and after a few casts, I caught another 50+cm Flathead. As the tide slowed, things went quiet so I drove back across the bridge and waded out to the flats beside the old oyster jetty. I spent another hour wading in this area with the same soft plastic lure. 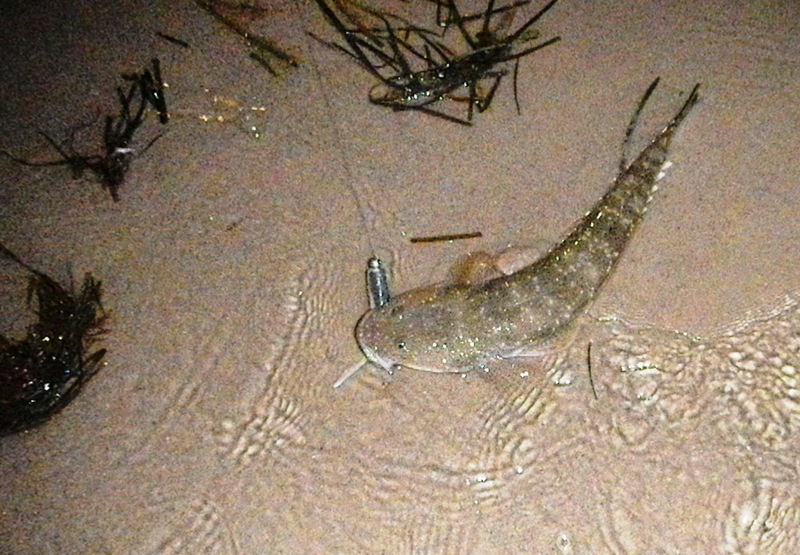 I caught 4 more Flathead, of which two would have been big enough to keep, at about the 50 cm size. It was now about 8.45 am and the rain started to get serious. It was now too cold and wet for me so I gave up. Unfortunately, it is rubbish weather for the school holidays. But this means there are less boats about and the fish are out there – if you can stay warm and dry long enough to find them. 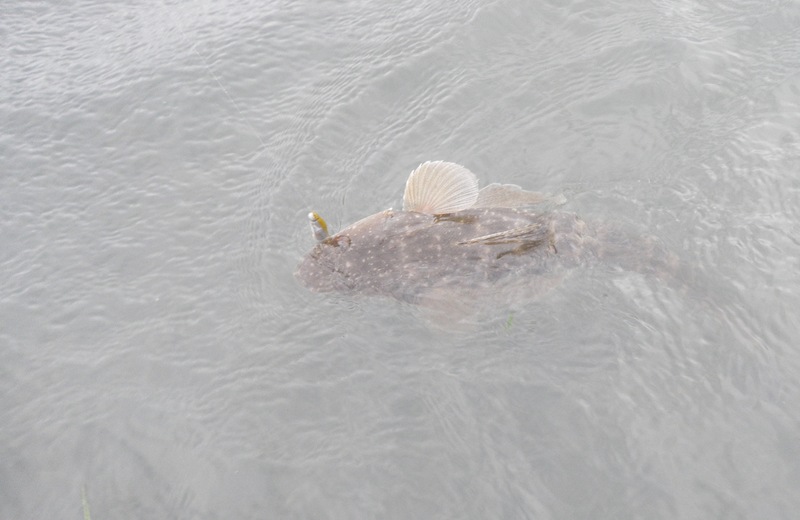 This entry was posted in Bribie Island, Fishing Reports and tagged Bribie Island, catching flathead on soft plastic lures, estuary fishing, fishing Gulp soft plastics, fishing soft plastics, fluorocarbon leader, landangler, landanglers Bribie fishing report. Bookmark the permalink. Haha I have got the opposite problem, “the family are in revolt, demanding fresh fish for a few days !